FORT GEORGE G. MEADE, Md. 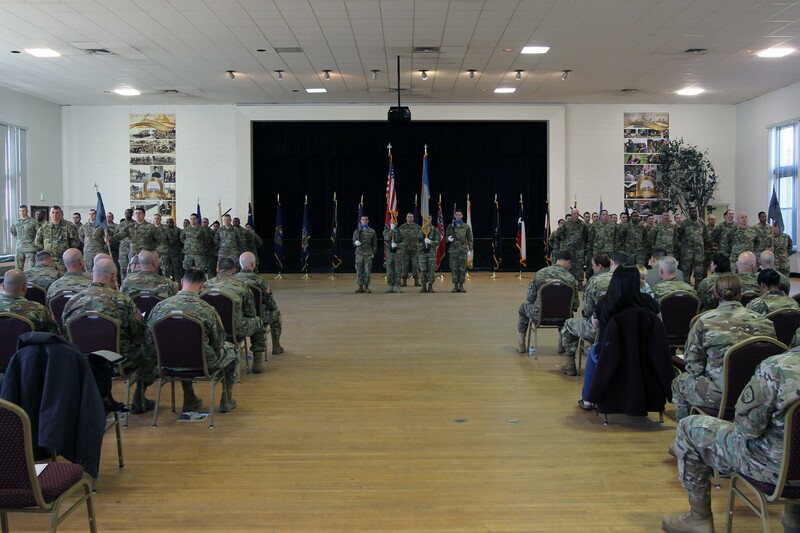 -- Col. Brian Vile, commander of the 780th Military Intelligence (MI) Brigade (Cyber), hosted a transition of authority (TOA) ceremony between two Army National Guard (ARNG) formations whereby one cyber battalion transitioned with another to continue the Task Force Echo cyberspace mission. "It is important for Soldiers going back to their States, in order for them to remain relevant, to take the skills they now have and continue to put them to use within their communities," said Riedel. "I would also like us to continue our partnership with our Active duty counterparts so we can stay engaged." 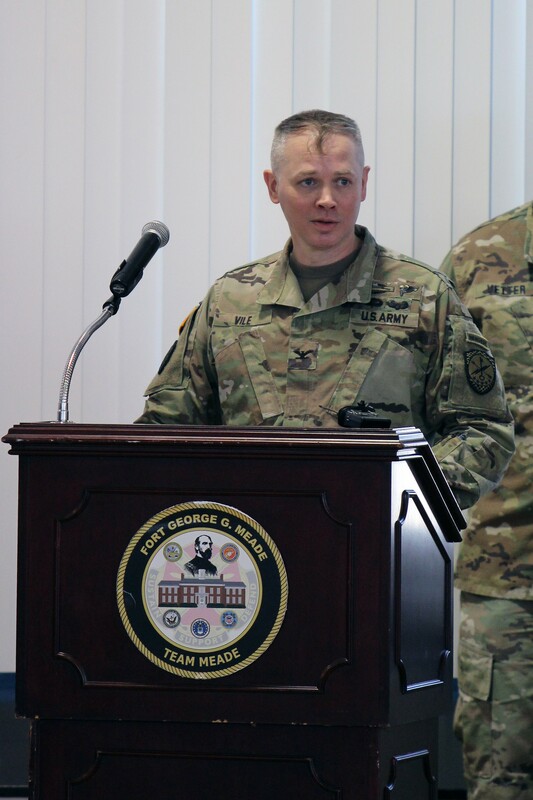 "My message to the States' leadership is that my Soldiers and I are grateful for the opportunity, because we know it's a sacrifice to take their cyber talent and allow them to do a mission like this," added Riedel. "It's definitely value added. We are coming back stronger, ready, and equipped to support their cyber requirements -- 'Cyber Up'." 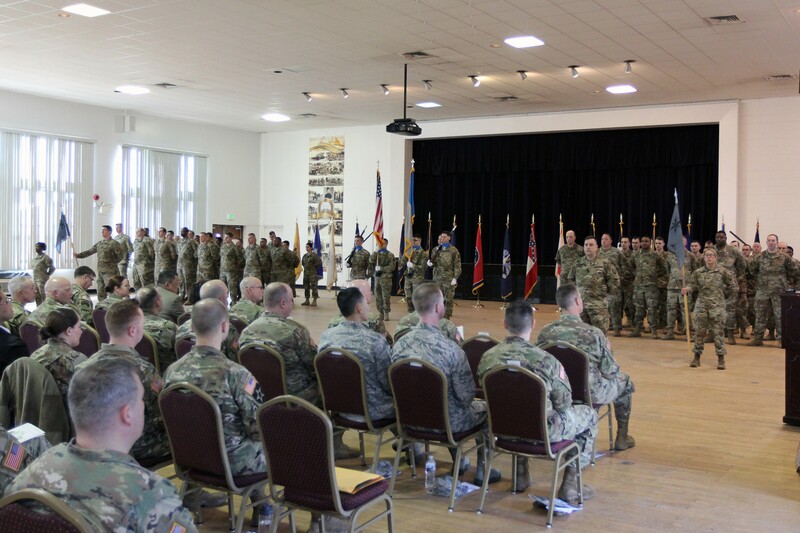 Lt. Gen. Stephen Fogarty, the ARCYBER commanding general, spoke to the TFE II and III Soldiers before the TOA ceremony thanking them for their service and challenging them as they either go back to their home states or as they continue the cyberspace operations' mission. "I can't thank you enough. You are away from Family, you are working long hours, working with dissimilar systems…I know 400 days is a long time," said Fogarty. "You came together, trained together, you started to operate, and it is been indistinguishable to me (from their active duty counterparts)." "We must be persistently present in cyberspace. We must be persistently engage with our partners and our adversaries, both in and through cyberspace, to advance American interests and degrade malign activities, and we must persistently innovate, fighting harder and smarter to stay ahead, developing tools and techniques faster than our enemies can defeat them," said Vile. "The Soldiers before you play a critical role in this fight. With skills, dedication, and innovation, the United States will be able to deter, and when directed, defeat our adversaries in and through cyberspace." Though he couldn't be at the TOA ceremony, Gen. Paul Nakasone, commander, U.S. Cyber Command and director, National Security Agency/chief, Central Security Service, talked to the outgoing ARNG Soldiers assigned to Task Force Echo II and gave them the following advice on March 11. 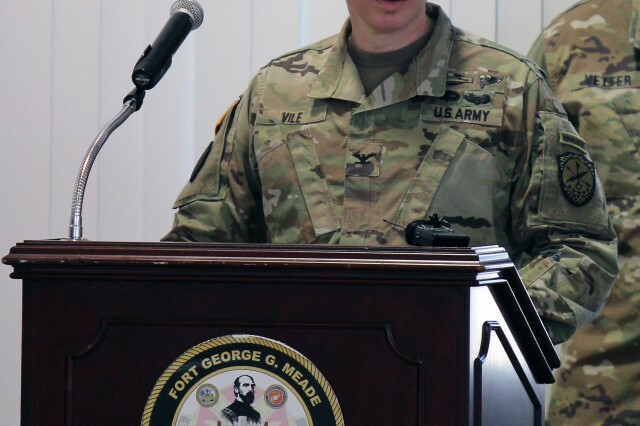 "You know the folks that operate out of Fort Meade, the folks that operate out of Fort Gordon, or the people that you want to call when you have a question. Don't lose those contacts. This is the epicenter for change," said Nakasone. "Second thing is Persistent Cyber Training Environment, PCTE. As we bring that on in the next six to 12 months I think one of the key things that we have to do is make that ability resident within your training facilities. And the last part is to stay engaged, stay involved, and stay interested. There is nothing that ever replaces any of those three activities." 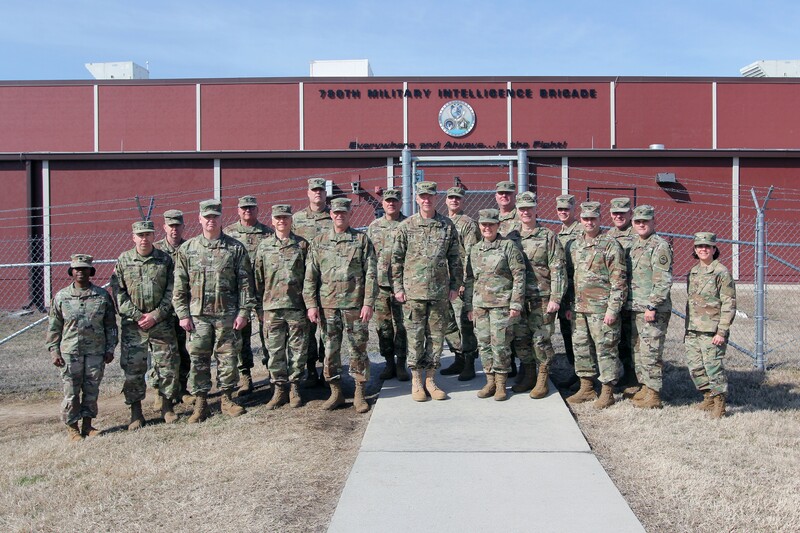 The incoming and outgoing task forces are part of the 91st Cyber Brigade. 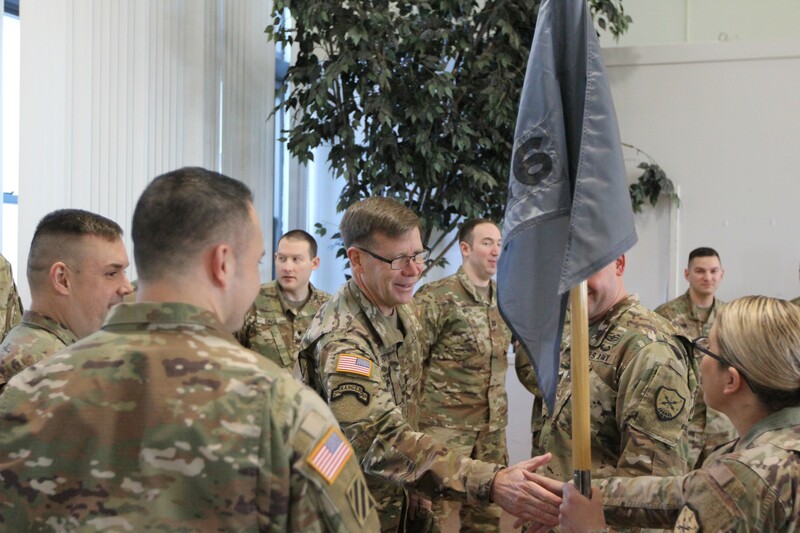 The 91st Cyber Brigade is the Army National Guard's first and only cyber brigade and first unfurled its colors in September 2017. According to their mission statement, the brigade provides training, readiness and oversight of all ARNG Cyber Protection Battalions in order to provide ready, fully resourced, and proficient forces capable of conducting cyberspace operations in support of state and federal requirements. 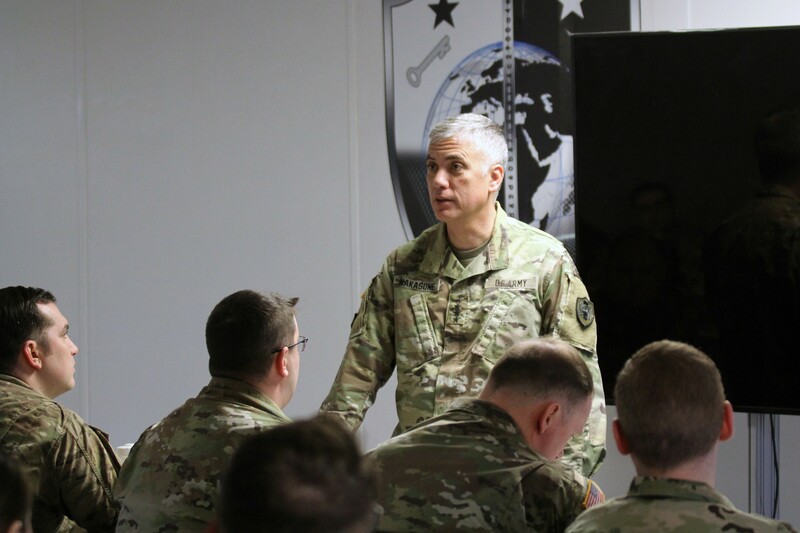 The brigade, comprised of Soldiers in thirty states, conducts cyberspace and information operations as authorized or directed to ensure freedom of action in and through cyberspace and the information environment and to deny the same to any adversary.